Photoshop is the cornerstone of the graphics industry and understanding its 3D capabilities is becoming a requirement for graphic designers, photographers, and creatives alike. Starting with the fundamental tools and ending with advanced resources, Adobe Community Professional Stephen Burns guides you with a clear voice and creative exercises that encourage you to work as you read. 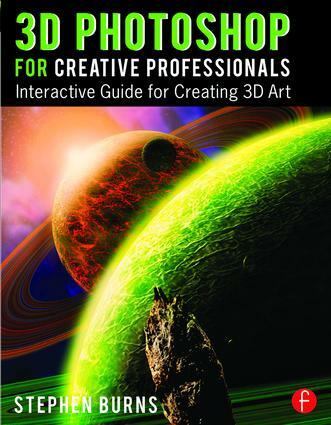 Accompanied by a free app that includes video tutorials, interactive models to compare your activity work from the book against, and on-going updates about the latest Photoshopreleases, this book will elevate your art off the page and into a new world of possibilities. Stephen Burns (www.chromeallusion.com) is a digital artist and an ACP (Adobe Community Professional) and has taught digital creativity internationally. He is also the president of the San Diego Photoshop User Group which is currently the largest Adobe Photoshop user group in the USA. He is a guest writer for a number of magazines including Photoshop User Magazine, and is also the author of several books, such as Photoshop CS5 Trickery & FX and The Art Of Poser and Photoshop. He has been a corporate instructor and lecturer in the application of digital art and design for the past 15 years internationally. He also exhibits digital fine art around the world at galleries such as the Durban Art Museum in South Africa, the Citizens Gallery in Yokahama, Japan and the CECUT Museum Of Mexico.